Why board an international train and go across sea, land and bridges to see 70mm? The Savoy on Steindamm in 2013. Why board an international train and traverse sea, land and very long bridges to see 70mm? Well, why not? Especially being able to combine a visit to an original Todd-AO cinema, while seeing a new 70mm film at the same time! I felt it would be worth the time, effort and expense to do so. It's not a coincidence I chose this cinema for this "Todd-AO Express" mission. 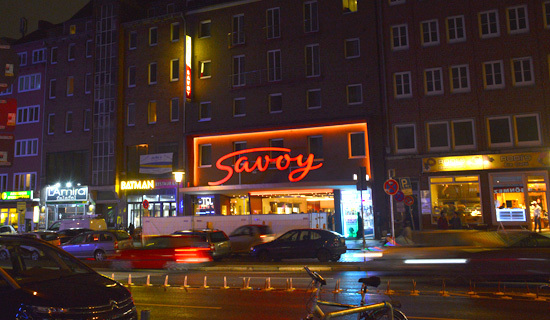 The Savoy in Hamburg was the very first purpose-built Todd-AO cinema in Europe. It opened 14. March 1957 with a huge curved screen, and 2017 is the 60th anniversary of the Savoy. To see an authentic 70mm premiere at the Savoy has been on my wish list for a long time. My "Todd-AO Express" journey coincided with the international 70mm release of Kenneth Branagh's "Murder on the Orient Express" (-, or MOTOE, as it is sometimes affectionally called). I've looked forward to see his adaptation of the classic Agatha Christie tale of a mystery on a train for a long time esp. when it became known he was photographing it on 65mm film. I like Kenneth Branagh's work, and consider his previous 65mm adventure "Hamlet" a masterpiece. This mission would satisfy several goals. See an authentic 70mm premiere, and see it on a curved screen in a historic Todd-AO cinema. I decide to go in style to see the new train movie on Saturday 11. November 2017, two days after its official German premiere, and two weeks ahead of its Danish 70mm premiere. I happen to believe in train travel as the best way to go, and in this case it could not be more appropriate. It was a 16-hour full day excursion to Germany and back, for the magical 70mm. Here's my diary of travel thoughts from the "Orient Express" premiere in Panavision Super 7OMM in Hamburg's prestigious Savoy Film Theatre. Time to get out of bed and depart for Hamburg. I've been to Hamburg many times, as this metropolis is the gateway to Europe when you go by train south from Scandinavia. My visits have often been short, usually an hour or less, just changing platforms between two trains there. The central station is an impressive building with a grand arch covering all 14 train tracks. There is always a buzz of suitcases, locomotives, and iron wheels against rails echoing in this cathedral of transportation. This time, however, Hamburg is the end my rail journey of the day. I am about to board another Express around one o'clock in the afternoon, but it is an entirely different kind of Express. It's the Orient Express, and it is departing from the nearby Savoy cinema in Steindamm street, 5 minutes walk from the central station. 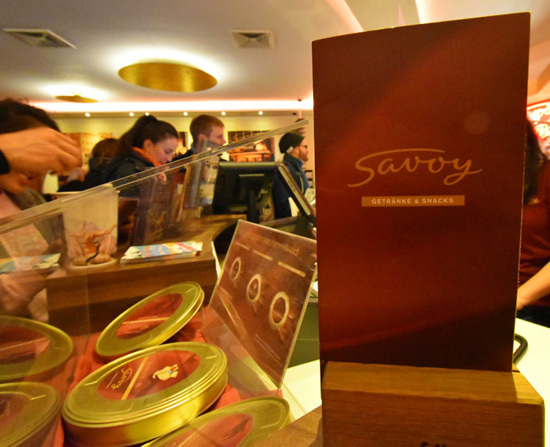 Savoy gift certificates are sold from the cafe in metal movie cans. Passing Vordingborg, and few moments later the impressive 3,2 kilometer Storstroems Bridge (opened in 1937), with its three grand arches in the middle. For a native of Copenhagen, and since my first visit to Paris in 1981, crossing this bridge, always meant excitement for me. I am finally travelling into Europe by train crossing an amazing long railway bridge. I doubt the daily commuters think any of it. 45 minutes later, the entire train rolls onto the ferry in Rødby Færge to cross the Baltic Sea. Today the sun is shining, and strong winds up to 15-20 m/sec blows from the west. An hour later, the sea voyage comes to an end and my train continues from Puttgarden in Germany, and Hamburg is within reach. Arrived in Hamburg, and only a few steps away from the Savoy. The station is very crowded with travellers everywhere. In September while returning from the wonderful Schauburg Todd-AO Festival, I e-mailed the Savoy from the train and said, "Passing through Hamburg Hauptbahnhof in some hours, and if possible, can I have a look at the Savoy before my next train, please? The projectionist Achim Orlia replied to my mail in the evening, when I was well away on my corresponding train, bound for Copenhagen. We failed to connect in time this time. I admit my notice was very short. But hey, it was worth a try. The history of the Savoy has already been documented in great detail by Gerhard Witte, so here's a short re-cap. The Savoy opened in 1957, and was equipped to show Todd-AO from the beginning. 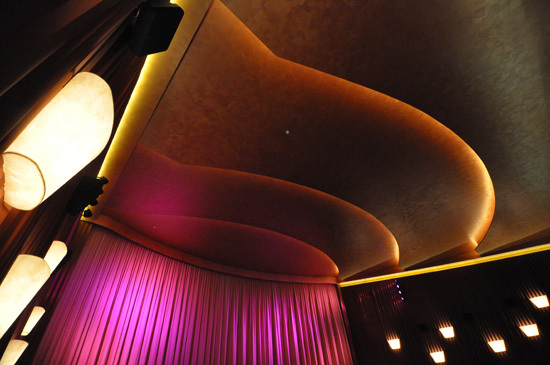 The design of the cinema was built around the curved screen, which was the essence of Todd-AO. Thanks to Todd-AO's High Fidelity 6-channel sound system, and the sharp 70mm pictures on a huge screen, it was a sensation when it first appeared. So life like, it gave the audience a sensation of being "in the movies". A huge screen which nearly curved around the audience - if they sat on the first few rows of seats it actually extend that much. A new cinematic experience, which allowed the audience to be part of the action on the screen. New Sight! New Sound! New Screen! It was audience participation, which we all take for granted today. Today's techno gadgets are called "4K", Dolby Atmos, comfy chairs, huge screens, and much more. But essentially it serves the same purpose. To get the audience into the cinema. 60 years later, on Friday 10. November 2017, "Murder on the Orient Express" premiered in a 70mm system similar to Todd-AO. In between all those years, the Savoy has lived a tumultuous life. It is the unusual story of a cinema with many years of film successes, decline in business, multiplexing to five screens in the '80s, closure in the '90, re-opening as a store, threats of demolition and ultimately, the rise, rebuilding and re-opening June 19, 2013, as a luxurious lounge cinema. The Savoy and the view from the screen, in 2013. Note the first row and the foot rests and space for two wheel chairs. Under the skilful hands of renovation Architect Heinz-Jürgen Schuhmacher, the new owner, Hans Joachim Flebbe (1951), had the Savoy completely rebuilt, and re-launched as a high-level lounge cinema. Mr. Flebbe is the founder of the CinemaxX cinema group, which he left some years ago. 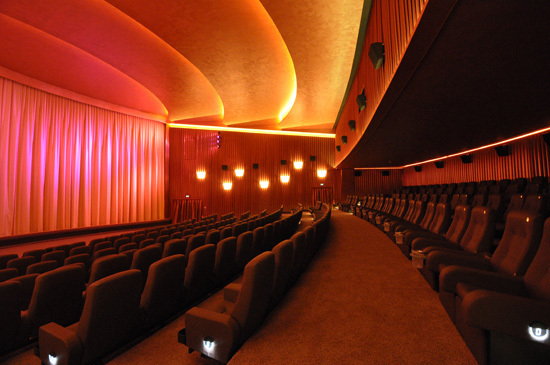 In 2008 he re-opened the Astor Film Lounge in Berlin, and since then he has renovated a hand full of classic German cinemas to their former glory, and adapted them to the needs of a modern audience. The Savoy originally had 957 seats. Today only 324 leather seats are left, but they are all high-quality Norwegian produced Skeie seats. All seats are very comfortable, and the first row (N) are recliners with individual foot rests. You can almost lie down and watch the film. There is very good space between rows, and the Savoy has space for three wheel chairs. There are 13 rows, with row N next to the screen, and row A being furthest away from the screen. Achim and Theatre Manager Gary Rohweder replied to my e-mail in September, and I would be welcome as their guest. We discussed the possibility of a visit in the event "MOTOE" would premiere in 70mm at the Savoy. Not long after, the premiere date was settled, and we agreed that a visit on 11. November would be perfect. I could go to Hamburg in style on 1st class train, see "MOTOE" in the magic of 70mm, in a historic Todd-AO environment, and later make a visitors report about the cinema for in70mm.com. All at the same time; trains, cinema and 70mm. What is not to like? Next was the question of the time of the show. To keep it as a day trip, I would only have a window of opportunity between 12:20 and 17:28, between my arrival and departure from the central station. In the end, the schedule was announced and it turned out perfectly. I could see the film at 13:00, and talk with Achim and take pictures after the film, well ahead of my late afternoon departure. 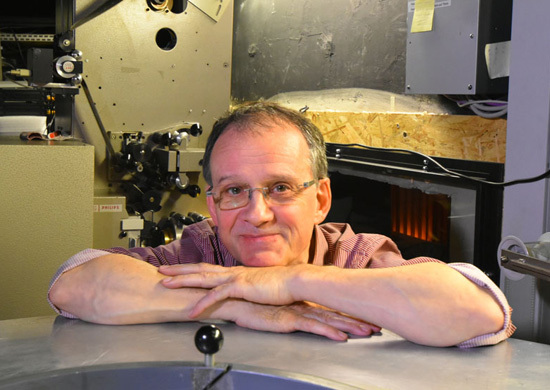 Projectionist Achim Orlia hasn't seen many of the classic 70mm film, and would like se films like "South Pacific" and "Oklahoma!" in Todd-AO. I met Achim in the Savoy Café, where he was busy serving the customers. 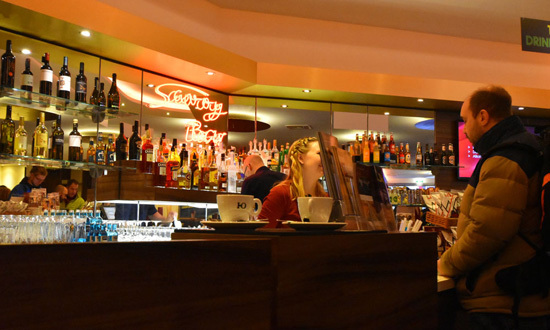 A queue of guests asking for tickets, popcorn and refreshments waited patiently to be served in the nice bar, decorated with red neon lights and mirrors. The cafe had everything from chocolate, tea, coffee, beers and whiskey. Everything your heart desires to make the film enjoyment perfect. The audience could also buy an assortment of gift certificates. The colors in the foyer area are a mix of yellow, dark brown and red. Some of the floor is tiled with dark tiles, and other areas are carpeted in red. Indirect light everywhere and candles on the cafe tables. 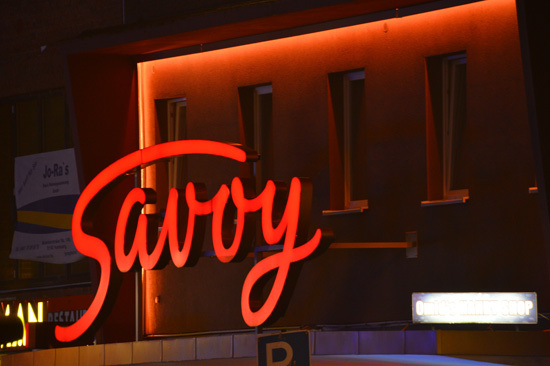 A big red SAVOY sign above the entrance doors signals "Here's a cinema" to the pedestrians. Outside under the canopy is a single display to the left about the Savoy history, and just inside the immense glass doors are three lit poster cabinets - one on each, side which welcomes you with information about current and coming attractions. Films are generally shown in the original English versions and without German subtitles, with the odd exception every now and then. "MOTOE" is shown in English and German versions. Achim showed me the way to the projection room upstairs. One DP75 projector and a Kinoton ST270 non-rewind system was all ready to go. The film on the platter, the lens in the machine, amplifiers ON - just waiting for Achim. "Push the button Achim!". Achim (1957) was originally trained as a theatre make-up artist, and worked two years in this profession. He later realised that cinema was his real, or reel call and he has been projecting films since 1981, when he moved to Hamburg. The last four years at the Savoy, and before that, at the CinemaxX Dammtor - on the same DP75, which is now at the Savoy. The Kinoton Non-Rewind ST270 came from the Grindel Cinerama, which closed in 2008. Achim admitted he hadn't seen a lot of the classic 70mm films, and would like see films like "South Pacific" and "Oklahoma!" in Todd-AO if the opportunity ever comes by one day. The Savoy and its beautiful Vorhang, which is the curtain, in 2013. The Savoy had kindly arranged my ticket and placed me in Row G, seat 13, which tuned out to be right in front of the screen. Row G is even raised two steps, so I had a nice unobstructed view of the ca. 16,5 x 7 meter curve. A very nice 70mm sweet-spot. The Savoy has a modern 3D silver screen installed, which largely follows the original CinemaScope screen dimensions, however, much larger. In fact, it is nearly 5 meters wider compared to the original CinemaScope screen size of 1957. The original 1957 Todd-AO Perlux screen measured 17,4 x 7,6 meters (Invoice of December 1957), with adjustable curvature depending on the format being shown. Deep curve for Todd-AO, and a more shallow curve for CinemaScope. Screens with adjustable curvature was a feature for the very best Todd-AO cinemas sixty years ago. We went behind the screen to look for traces of this contraption. The left and right parts of the screen frame are actually still standing on wheels, but today, they don't move. The rear wall is covered with sound insulation, and are hiding more traces of the adjustable curvature mechanism. The show began with the adverts and commercials, and then a few trailers - one of which was "Close Encounters". All pre-feature elements were run on the digital projector. Very nice light and sound. Before the main feature, none other than Alfred Hitchcock (Voice played by Anthony Hopkins I guess) was nudging us not use our mobile phones during the show, through some cinematic magic. The Savoy and its beautiful Vorhang and ceiling, in 2013. 15:30 How was "Orient Express"? The curtains went in and out before the main feature, exactly as they should in any proper cinema. Lights went down and a big "MOTOE" slide on the screen, proudly announced it was shown exclusively "in 70mm". The FOX logo appeared and the film began. Very pleasant soundtrack by Branagh's house composer Patrick Doyle, and nice sound level throughout. Once again JBL speakers delivers the best sound. The picture was bright and sharp across the curve. The film was shown without German subtitles and presented in 2,39:1 format, similar to anamorphic Panavision. The 70mm frame was masked down per the director's wish I suppose. Achim told me horizontal masking could be enlarged (top and bottom) to show the full height of a 70mm frame. He used that during "Dunkirk". I often hear the complaint that "70mm is for out-door and wide vistas only", and "it is not useable for intimate stories set inside". I don't think so. Films like "Spartacus", "Ryan's Daughter", "Lawrence of Arabia", and even "The Hateful Eight" clearly shows how intense close-up are, when filmed on 65mm, and the detail of people's faces are unbelievably sharp. Every subtle motion of the actors are revealed in 70mm. "MOTOE" had many close-ups too and great detail, especially noticeable in the actors faces and clothes, but it did not appear as sharp as "Dunkirk", or even Branagh's own "Hamlet". The entire film was scanned, and the post-production process with all the special effects was done digitally and then re-printed back to 70mm. I had expected a picture quality a bit more like "Samsara" (in 4K), but that was not the case. The level of detail was impressive, however, but I doubt anyone but 70mm enthusiasts will notice the difference. General audience will hopefully just be dazzled by the story, enjoy the nice pictures, the music and all the extra effort by the cinema to present a premium product. A presentation you certainly cannot get at home. The Savoy foyer and ticket sale. Following the film I had a cup of tea in the foyer with Achim. He told me about the Savoy, and how happy he is to work there. As we were sitting and talking, the foyer was buzzing with people for the next show. Tickets and popcorn over the counter and a beer, a cafe latte, and some sweets. People in queue, and patiently waiting to give their order. Staff by the door checking the tickets, and the show is about to begin. The owner Mr Flebbe has re-introduced cinema as it should be. Where you can enjoy films precisely as the film makers want you to. On a big screen with good sound. The Savoy makes an effort to present the films in the best technical way possible. The audience seems to appreciate this idea. The number of annual visitors at the Savoy is between 120.000 and 140.000 guests and rising. The Savoy has several specialized film programs, one of which is the Savoy Film Club, which shows classics once a month on the big screen in English. "The English Theatre" live from London is very popular, as are the "SAVOY Sneak-Preview. The Friday-Late-Night-Sneak-Show at the Savoy Filmtheater!". A feature-length surprise sneak preview screened before its German theatrical release. 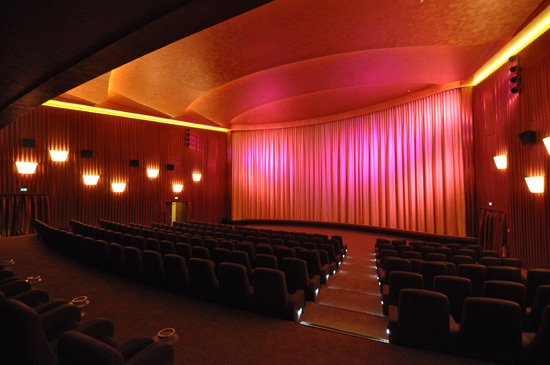 The Savoy also have Senior Cinema called "TRAUMKINO im SAVOY" (Cinema of Dreams), presented in German. The Savoy is a very beautiful cinema with a history going back exactly 60 years. 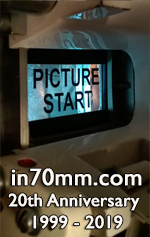 It's harmonic dimensions, and a big Todd-AO screen makes it ideal for 70mm presentations. 70mm advertising in display windows. Mr Flebbe is currently working on expanding his range of luxus cinemas in Hamburg, and will open three new screens in the city's popular Hafencity district sometime during 2018. My visit at the Savoy had come to and end. I left the Savoy around 16:30 to do a little shopping before my departure. Achim followed me to the door, and off I went. The Savoy is a rare cinema jewel. Built for the Todd-AO big-screen experience 60 years ago and amazingly is still around today to show 70mm. Surely it is one of the very few original Todd-AO cinemas remaining in the world. It is easy to imagine all the classic 70mm films being shown on this screen. If only walls could speak. Probably they would echo something like "I'm Spartacus", "These are a few of my favourite things", "Go back to your oar, Forty-One! ", "He was the most shameless exhibitionist since Barnum & Bailey", "Broadsword Calling Danny Boy" and many, many more. Todd-AO memorabilia found under the stage and now sitting on the projection room door. I have not seen many films in other German cinemas and cannot compare the Savoy to other cinemas with much authority. 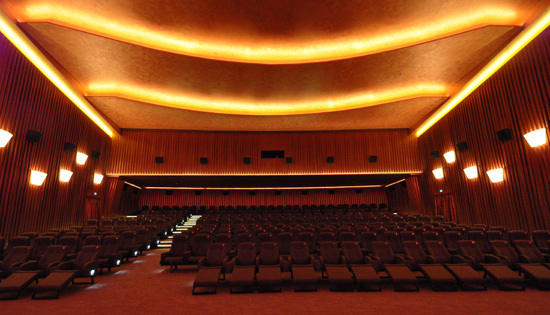 The only exception is the Schauburg Cinerama in Karlsruhe, where I have enjoyed many 70mm films since 2005 under the best 70mm presentation conditions imaginable. It was nostalgic to see 70mm at the Savoy too. The fact that the Savoy was the first European purpose-built Todd-AO theatre made this trip even more memorable. If you live anywhere near Hamburg, I highly recommend seeing 70mm at the Savoy. Mr Flebbe's Lounge Cinemas concept with cinema as it should be, is lovely, and is really something you should try. A 16-hour round trip, two times 5 hour travel time, 350 km by train each way and one film. Travel on the train between two nations, across sea, land and bridges to see "MOTOE" @ the Savoy was well worth the time spent. For me, it was fun, and a nice balance between nostalgia, and modern cinema and film. An amazing Saturday adventure. Thanks goes to my friendly Savoy host for the day Projectionist Achim Orlia, and Gary Rohweder (Theaterleitung Savoy Filmtheater), for making the visit possible.